The classics of the American songbook have long cast their spell over the piano bars of New York. It’s a culture that goes back to the 1940s, and it still renders participants of spectators nightly, as the cocktails and the memories mingle until one or another of the crowd around the bar break into song. 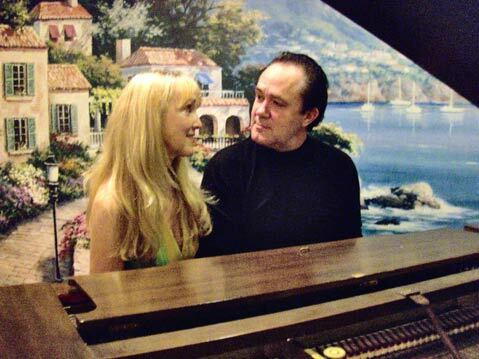 In Bernard Slade’s I Remember You, which opens this weekend at Circle Bar B Dinner Theatre, the pianist is a middle-aged Austin “Buddy” Bedford, and the action opens as his nostalgic dreams come true in the form of a young businesswoman named Tracy who falls for him and agrees to marry him. Time’s revenge on Buddy is not subtle. When the engaged couple travel to seek Tracy’s estranged mother’s blessing, Prunella recognizes Buddy as the man she loved and lost some 25 years before. To make matters yet more complicated, it seems that the love between Pru and Buddy still has some spark left. For Susie Couch, artistic director of the Circle Bar B Dinner Theatre and a 2008 Indy Award winner for performance, the show is a chance to realize a dream she has been nursing for almost five years-the dream of the lead in this triangle with two other actors who could make it soar. She has finally found the right collaborators, and I spoke with her about the experience. How did you find I Remember You? I read the play five years ago, but at that time I wondered, “Is Circle Bar B ready for this?” Then I saw The Producers in Las Vegas, and Tony Danza was in it, and he was great, and I was looking through the Playbill and noticed that he had just finished a run of I Remember You in Los Angeles. I went online, and the reviews were really strong, and the idea of doing the play here got back into my head again. Tell me about the casting. Austin “Buddy” Bedford, the piano singer, will be played by Clyde Sacks. In July, I saw Twelve Angry Men was playing, and I thought what a great opportunity to see 12 strong male actors and get an idea of what they are like onstage. Clyde was Juror Number 5, and he had this effortless New York look and style that fit perfectly with my image of Buddy. What about the role of Tracy? Lisa Beck, who plays Tracy, is someone I have known since she was 18. We could both relate to the mother and daughter relationship described in the play, and we had this personal connection as well, so it was a great match. What’s the style of the play? Well, the circumstances of the plot are bizarre. It’s unrealistic, and fantasy is a theme throughout. But that is its appeal; the show uses the bizarre circumstances and the emotional impact of the songs to go someplace that a lot of people will still recognize. Are you doing anything unusual with the production? We have built a bar that extends out into the audience, so some audience members will be seated as if they were in the piano bar where Buddy plays. In the original show, the piano bar audience was portrayed by cardboard cutouts, so we are hoping this will allow for more interaction between Buddy and the audience. Why are you doing this show now? We are really excited about doing I Remember You now because it represents artistic growth for Circle Bar B. There will be some toughness to it because of the intimacy of our theater and the emotional impact of the story, but we are hoping that’s what will make it work. I Remember You plays from September 20 to November 2 at Circle Bar B Dinner Theatre. Friday and Saturday evenings begin promptly at 7 p.m. with dinner and are followed by the show at 8 p.m. in the theater. Sunday matinees begin with the meal at 1 p.m. and the show at 2 p.m. Call 967-1962 or visit circlebarbtheatre.com for tickets and information.